Wake to the loon's echoing call, smell the morning air, sweet with the night's dew. A perfect place to start your day. 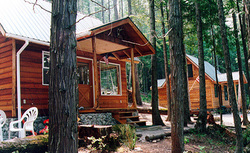 Two deluxe cozy cabins, set 35 feet from the shore of a pristine mountain lake, amidst towering cedar, tamarack, pine and birch trees. A great base for exploring, relaxation, Glacier National Park, wildlife and birding. .If you are coming from Glacier National Park's Camas Creek entrance, 14 miles, or Blankenship Bridge Road, 1.2 miles to Lake Drive which will be on your right.